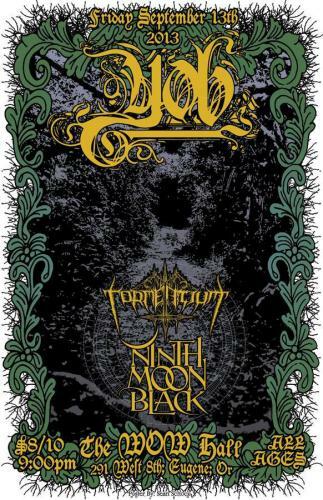 On Friday, September 13, the Community Center for the Performing Arts and University of Oregon Campus Radio 88.1 FM KWVA invite you to don your darkest clothing and head down to the WOW Hall to celebrate this unlucky date with metal bands YOB, Ninth Moon Black and Tormentium. The journey began back in 1996 when vocalist/guitarist/songwriter Mike Scheidt began composing classic doom metal riffs in the vein of his heroes, Sleep, Cathedral, and Black Sabbath. By the turn of the millennium, the band had recorded debut album Elaborations of Carbon, and was rapidly growing from a NW secret, to a highly sought after support act for tour stops by luminaries like High on Fire and Isis. By 2003, Candlelight had the rights to sophomore album Catharsis, a record with a side-spanning title track that breaks twenty-three minutes into a heartbreaking odyssey. Full US tours commenced, and YOB proved to audiences night after night that it had chops and sonic glory to deliver that exceeded the promise of its albums. Brian Slagel of Metal Blade records took note, and the man who discovered Metallica, Slayer and Voivod took YOB under his wing. Two fantastic albums were released, 2004’s The Illusion of Motion, and 2005 masterpiece The Unreal Never Lived. By this time, YOB had shed the sound of its early influences, and was in turn creating a new and original doom sound that would in turn inspire others, from young upstarts around the world, to avowed YOB fans Tool. In 2009, YOB re-awoke from its slumber, releasing the surprising and long-awaited The Great Cessation (it’s debut for Profound Lore records), which proved the band retained every ounce of inspiration, and accrued recognition on nearly every year-end list, from the Village Voice to Terrorizer. More surprising still was how much YOB’s legacy had grown during its hiatus. Invitations to perform at Scion Rock fest between Shrinebuilder and Pelican were followed by the unprecedented response at YOB’s first European appearance at the fabulous 2010 Roadburn festival in Holland. By 2011, YOB stood at a crossroads. Would a world hungry for doom support the band, or would YOB remain cloistered in the grim northwest, appearing only when the moons align? The choice was taken from the band’s hands as sixth album ATMA was released to massive critical acclaim. Lengthy tours of the US and Europe followed, and YOB’s popularity went from speculative to soundly proven. Fans quickly lost count of year-end list appearances for ATMA. Ninth Moon Black is a five piece instrumental band from the Pacific Northwest that conjures musical influences from the realms of psychedelic, ambient and post metal. Aware that instrumental music is not for everyone, NMB strives to write pieces which challenge that boundary, keeping listeners involved with intricate melodic passages, emotionally driven progressions and cohesive yet uniquely structured songs. Writing and performing music that is very cinematic in nature, Ninth Moon Black aims to create an experience for the listener, often showing self-produced experimental films, or providing an epic soundscape for visual odysseys such as Begotten, Decasia and Man With A Movie Camera. Since the release of their 2008 self-titled debut, NMB has shared the stage with bands such as Middian, Melt Banana, Indian, Earth, Brothers of the Sonic Cloth, Dead Meadow and Ludicra. In 2009, they provided West Coast tour support for Wolves In The Throne Room and Minsk. January of 2011 saw the kickoff of a college radio campaign with Team Clermont for their follow up EP Kalyug, which debuted on the CMJ Loud Rock chart at #31. It was the only self-released album on the chart that week and continued to hold various positions for the duration of the campaign. Kalyug also debuted on the CMJ Loud Rock Select albums chart at #58, and the track "Kalyug" charted on CMJ's Loud Rock Select Tracks chart at #87. This year NMB completed the recording of their third album Chronophage with Eugene’s legendary Billy Barnett of Gung Ho Studio. Mastering was done with Billy Anderson. Their first single, Mors Carnis, has been featured on the Italian compilation Falling Down IIV alongside fellow post/psychedelic bands such as Pelican, Across Tundras, Akhmed and Mouth Of The Architect. Tormentium was conjured in the autumn of 2004 amongst the rainy woods of Oregon’s Willamette Valley. It was conceived by axemen Wes Beanblossom and Ray Eversole, vocalist Sky Skizz, drummer Jesse Levine, and bassist John Arbogast, with the intent of expressing their darkest vision to a reality. Covering a wide range of emotions and subject matter, the band has written of unknown horrors, prideful impiety, and story-like tales of destruction. As a metal band tapping into a plethora of inspirations, the band has always broke the bonds of expectations to cultivate a creative sound that is melodically grandiose, eerily haunting and violently brutal. Tormentium sparingly released a few hand-made demos during the years of bloodying stages, sharing performances with a variety of influential bands such as Horna, Impaled, Phobia, Inquisition, Noctuary, Rotten Sound, and High On Fire. However, the band has been known for its undying support of the Pacific Northwest’s underground metal scene, which is where the band’s core fanbase grew. Over six years the band went on to write enough material for a few albums, yet most of the songs were never released, and left to live on in the hearts of the local diehard fans. In the summer of 2010, guitarist Ray Eversole left the band to pursue his career as a professional tattoo artist. With Wes taking over as the main songwriter and sole guitarist, the now four-piece increased their focus on the music’s dark narrative, feeling there were more stories to tell. In 2011, the band produced two releases. A split with longtime allies INFERNUS (Portland, OR) included the last material written as a five piece with Ray Eversole, which was a pro-printed CD with a lush 6-fold booklet, limited to 500 copies on Dark Forest Productions. The EP "Cursed Beyond Flesh" saw the first new material as a four-piece band, pro-printed on CD and self released to 100 copies. “Cursed Beyond Flesh” focused its high energy to share insight to the blessings of damnation, destruction, and things that lurk beyond the dark. In 2012, the band released a split with local brothers CULT OF UNHOLY SHADOWS entitled “O Lorde In Thee I Trust”, the title a mockery of Christian martyrdom. This effort was self-released on CD to a small 100 copies, in collectable DIY-style glory. Tickets are $8 in advance, $10 at the door. Doors open at 8:00 pm and showtime is 9:00.On Friday, September 13, the Community Center for the Performing Arts and University of Oregon Campus Radio 88.1 FM KWVA proudly welcome YOB back to the WOW Hall along with Eugene's Ninth Moon Black and Tormentium.